On a day where blizzard conditions shut down most of the northeast, Chris Kunitz turned up the heat in Mellon Arena Wednesday night. 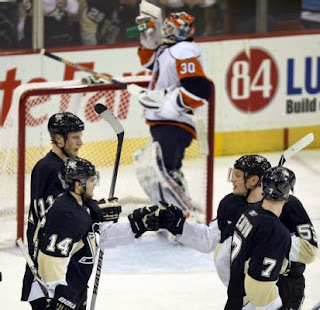 He scored two goals and Evgeni Malkin added another as the Pens beat the Islanders 3-1. This was even more special because it was only his second game since he missed over a month due to injury. This feat was witnessed by a crowd of over 13000 people, a remarkable turnout for the conditions outside. And though not every seat was filled, the Pens continued their sellout streak to 147 consecutive games. Kunitz got his first goal midway through the second period on a breakaway with Evgeni Malkin. His second came with just over 5 minutes to go in the third to clinch the game for the Pens. Malkin scored with 3 minutes remaining in the second off of a Sergei Gonchar slapshot. Perhaps the biggest turning point in the game, however, was Kris Letang's sprawling dive in front of an empty net saving a sure goal and preserving the tie. The Islanders did manage to beat Fleury once, and that was off a Franz Nielsen backhand. The win combined with the New Jersey Devils' loss to the Flyers Wednesday night moved the Penguins within one point of the division lead. The Pens' next game is Friday night at Mellon Arena against the New York Rangers.